Production by Bernzomatic, one of the most recognised names in the American plumbing and DIY sectors has been enhanced by the use of technology from Tewkesbury-based MecWash Systems Ltd. The company has installed a wash system for Bernzomatic – part of the Tools, Hardware and Commercial Products Business Unit of Newell Rubbermaid – in Medina, New York, where the manufacturer's acclaimed range of hand held torches is produced. The installation is not only helping to maximise production efficiency and quality, but is also benefiting the organisation's environmental performance. The aqueous-based technology at the heart of the MecWash design not only produces excellent component cleaning results, but also helps users to avoid the acknowledged drawbacks associated with the use of solvent alternatives. 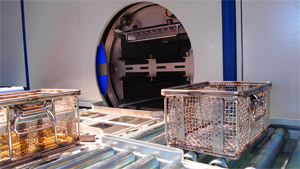 The installation at Bernzomatic – a MecWash Midi – is dedicated to the cleaning of brass parts, including those where blind holes and small diameter apertures are commonplace, many thousands of which are machined each day at the plant and inevitably emerge from this process coated in machining oil and brass chips. "It is vital this material is removed for the products to function well and we are delighted that our system, which is based on the combination of high volume spray and immersion washing and rinsing plus ultrasonics, is producing excellent results," comments MecWash Systems Managing Director, John Pattison. 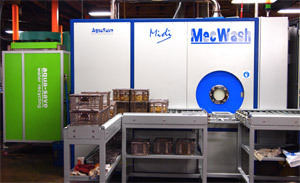 The company's commitment to the highest environmental standards is also reflected in its decision to link the MecWash Midi to an Aqua-Save 30 waste water recycling system – supplied by MecWash's Aqua-Save Technologies Division. By a process of evaporation, this enables the wash and rinse solutions to be re-used whilst reducing the volume of waste material to, typically, just 5% of its volume for disposal off-site. This not only optimises the use of the wash solution, but also minimises Bernzomatic's need to use ‘city water' – itself a significant contributor to its production efficiency. "We also fitted a chip settlement tank to the installation in New York which collects brass chips after every wash cycle," adds John Pattison. "Originally developed through other successful export activity – in this case for a customer in Australia – the concept helps the main wash tank avoid brass chip contamination and also provides Bernzomatic with an opportunity to reclaim this valuable metal for future use." Installed jointly with MecWash's North American partner based in Ohio, the installation for Bernzomatic is an excellent example of the increasing acceptance of aqueous-based cleaning technology in the American marketplace. Because the project is centred on one of the most widely respected names in its field, it reflects the excellent reputation for quality also inherent in the MecWash design and build. "This is a major installation for an important overseas customer and was achieved only after a comprehensive assessment of alternative American and European suppliers by Bernzomatic's Manufacturing Engineer and Maintenance Manager, Jeff Rohde. We are delighted to have been specified for a project that demonstrates both our capability and our increasing success in a competitive export market," concludes John Pattison.